Venezuelan President Hugo Chavez says he is freezing plans to develop a nuclear energy programme in the light of the crisis in Japan. Venezuela signed a deal with a Russian company last year to develop a nuclear power plant over the next decade. But Mr Chavez said events in Japan showed the dangers of developing nuclear power were too great. Chile has said it still aims to sign a nuclear accord with the US next week despite the crisis in Japan. Countries around the world have been reconsidering their nuclear policies in the face of the crisis at Japan's Fukushima nuclear complex triggered by last week's huge earthquake and tsunami. President Chavez said he was calling off Venezuela's plans to build a nuclear plant. "It is something extremely risky and dangerous for the whole world," he said. "Despite the great technology and advances that Japan has, look at what is happening with some of its nuclear reactors." 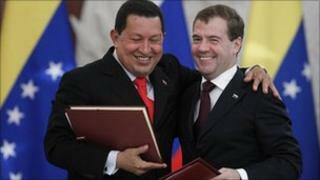 Mr Chavez added that global concerns about the safety of nuclear power would boost demand for Venezuela's oil exports. In Chile, President Sebastian Pinera said he would go ahead with a nuclear co-operation deal with the US that is due to be signed during President Obama's visit next week. Mr Pinera said Chile had to keep the option of nuclear power open to fuel its growing demand for energy despite anxieties over the nuclear disaster in Japan. "Chile needs to learn about nuclear energy, and that is why we have signed accords with France and Argentina and we will sign another with the US," he said after meeting the Japanese ambassador to express his condolences. Like Japan, Chile is on the Pacific "Ring of Fire" of seismic activity and is prone to earthquakes and tsunamis.